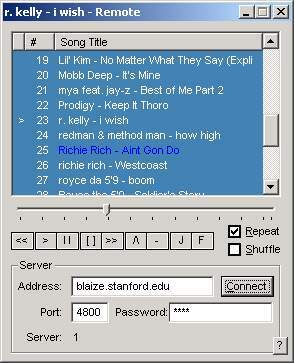 Remote is a Windows client for httpQ, a network server plugin for Winamp. You can use remote to control an httpQ-enabled Winamp over the Internet. Remote can control playback, manage playlists, search and find songs, and show Winamp’s status in real time. Winamp is commonly used with Shoutcast as a streaming audio platform, for anything from listening to your music remotely to running a full-blown Internet radio station. With remote, you can control your Winamp Shoutcast platform from anywhere. The zip file includes the full source code and Visual Studio project files for building remote on Windows. Remote is distributed under the GPL. Copyright 2000 Ryan Barrett.